Our penthouse offers timeless elegance and amenities not found in any other Koloa Landing® villa. You’ll enjoy 4 bedrooms (2 are masters), 5 bathrooms and 3 breathtaking private lanais – one complete with barbecue and beverage fridge to keep you stocked with refreshments day and night. Your massive kitchen boasts 2 wine fridges and dual dishwashers. Fall in love with the serene dining room that seats 10 and overlooks the crystal blue sea beyond. Local Kauai designer Sarah Lambson of Kala Interior Design has created a custom space that is at once elegant and completely natural. Fusing elements of island heritage with modern function, the penthouse feels wonderfully at home – and a world away. There is more than ample room for you and your guests with 2 master suites complete with grand king beds, private lanais and sumptuous appointments throughout. Generous in size with high ceilings and views galore, you will love unwinding in the serene abundance of these magnificent suites. Stay in to relax or entertain in grand style with an expansive dining area that comfortably seats up to 10 guests. With easy access to the large kitchen, a wet bar and a high-end island vibe, you just may discover that meals taste even better in paradise. 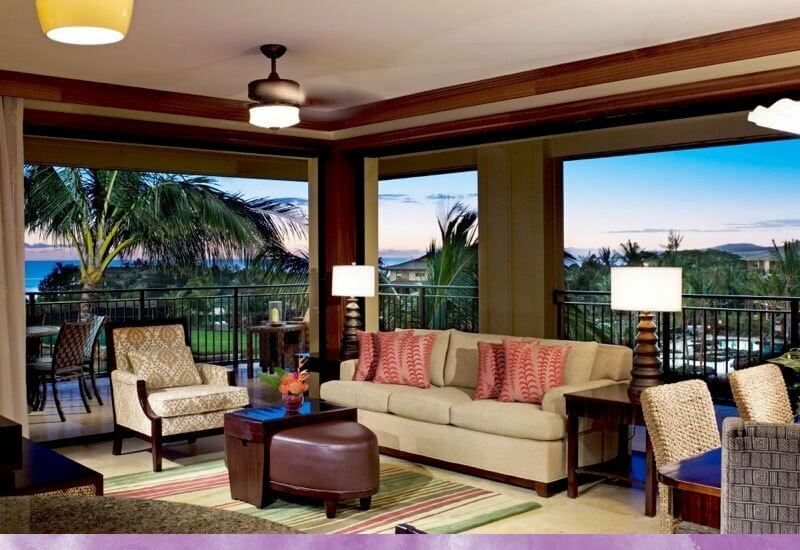 Koloa Landing®’s penthouse suite is the true Hawaiian experience at its most refined. Each luxurious appointment is thoughtfully conceived and infused with aloha spirit. You won’t just visit the island this time, you will feel a part of it. Koloa Landing®’s penthouse suite is so private and luxurious it is often the hideaway of choice for high-profile celebrities, film stars, corporate heads and dignitaries who appreciate the seclusion and the utter discretion of the Koloa Landing® staff. Every window gazes upon natural beauty and every plush appointment is thoughtfully conceived. In fact, everything here is infused with the warm aloha spirit. This is the true Hawaiian experience at its most exclusive. You will quite simply run out of adjectives to describe the lush landscape and ocean vistas from each of the penthouse’s three private lanais. Disappearing glass doors bring paradise inside, providing you with a deep sense of tranquility. Take your entertaining outside to the penthouse’s massive front lanai. Stocked with a full barbecue and beverage fridge, you will enjoy grilling up the fresh catch of the day and sipping hand-crafted tropical cocktails in the comfort and privacy of your own open-air retreat. Our Poipu beach villas – the largest of any Poipu hotel or resort on Kauai – offer casual elegance, expansive lanais and spectacular views for the ultimate Hawaiian vacation.